Chrubasik S, Enderlein W, Bauer R, Grabner W. (1997). Evidence for the antirheumatic effectiveness of herba Urticae dioicae in acute arthritis: A pilot study. Phytomedicine 4: 105-108. Dathe G, Schmid H. (1987). Phytotherapy for benign prostatic hyperplasia (BPH): Double-blind study with extract of root of urtica (ERU). Urologe B 27: 223-226 [in German]. Kirchhoff HW. (1983). Brennesselsaft als Diuretikum. Z. Phytother. 4: 621-626 [in German]. Krzeski T, Kazón M, Borkowski A, et al. (1993). 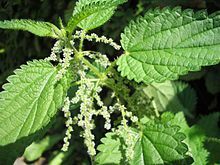 Combined extracts of Urtica dioica and Pygeum africanum in the treatment of benign prostatic hyperplasia: double-blind comparison of two doses. Clinical Therapy 15 (6): 1011-1020. Mittman, P. (1990). Randomized, double-blind study of freeze-dried Urtica dioica in the treatment of allergic rhinitis. Planta Med 56: 44-47. Yarnell E. (1998). Stinging nettle: A modern view of an ancient healing plant. Alt. Compl. Therapy 4: 180-186 (review).